(Bloomberg) -- The European Central Bank’s chief economist says there needs to be a solid monetary-policy case before officials act to mitigate side effects of negative interest rates on banks. 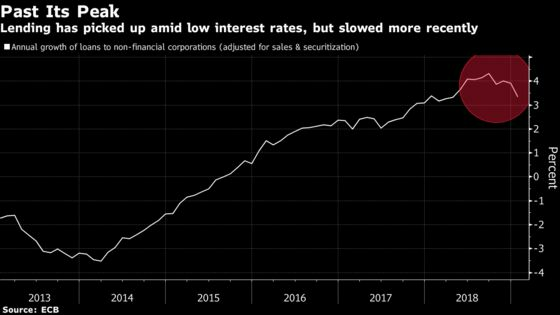 ECB staff are examining the issue of tiering -- where some of banks’ excess reserves are exempt from the lowest rate -- but action isn’t a done deal, Peter Praet said in a Bloomberg interview. The language about a monetary-policy case echoes that used by President Mario Draghi at the start of this year about a possible new round of long-term loans. Those were subsequently announced this month. Praet’s view comes in the wake of comments from Draghi about maintaining the positive effects of sub-zero rates while reviewing any negative fallout. 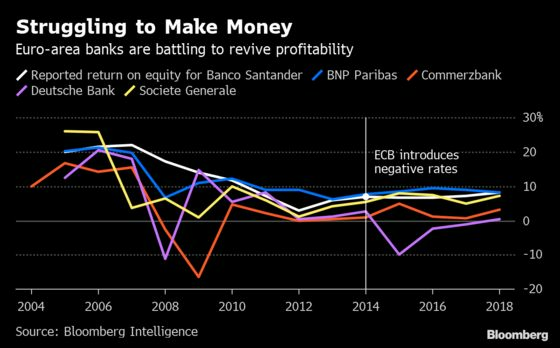 The remark was taken by investors as an assurance that the ECB is ready to ease a squeeze on profit margins produced by banks’ inability to pass on costs. European bank stocks fell on Thursday, with the EURO STOXX Banks Index trading 0.9 percent lower at 11:30 a.m. Frankfurt time. Interest in the topic has increased after a more persistent than expected slowdown forced a sharp downward revision in the ECB’s projections for growth and inflation and a delay in plans to raise borrowing costs. Economic confidence fell more than expected in March to the lowest level since 2016. Facilities to help banks are a current focus of the ECB. Praet, whose term on the Executive Board expires in May, said details on the new long-term loans -- which offer cheap funding for banks -- are likely to be revealed at the ECB’s June meeting, when policy makers will have new economic forecasts. “The next assessment of the economy in June will probably be a reasonably good timing to make an announcement on TLTROs before the first operation comes in September,’’ Praet said. The ECB has been vague about the parameters of the program, suggesting policy makers want flexibility to fine tune the tool to address whatever problem the economy faces when the loans are handed out. So far, they have only revealed that they will offer seven rounds of two-year funding, between September and March 2021, with the interest rate linked to the institution’s benchmark and an incentive for extending credit. The terms the ECB will initially present might change over the course of the program, Praet said. That means the loans could turn from a tool to extend long-term funding to the banking sector into a fully fledged stimulus if the economy takes a turn for the worse. For the moment, policy makers are standing by, watching the economy and politics take their course. “If the scenario gets worse than what we expect, we must be ready to activate the tools -- new tools also,” Praet said.